…And I’m going to go ahead an say that it was definitely in need of being dragged into 2019. Long drive completed, I walk up to the entrance hoping that the new look is suitably blog worthy, and worthy of that drive. “Oh wow” I say for the second time, but this time in reaction to the drastically different space I have entered from the before image. A smell of fresh paint still lingers, and fresh paint, decadent wallpaper and slick tiling adorns every wall with dark and modern effect. 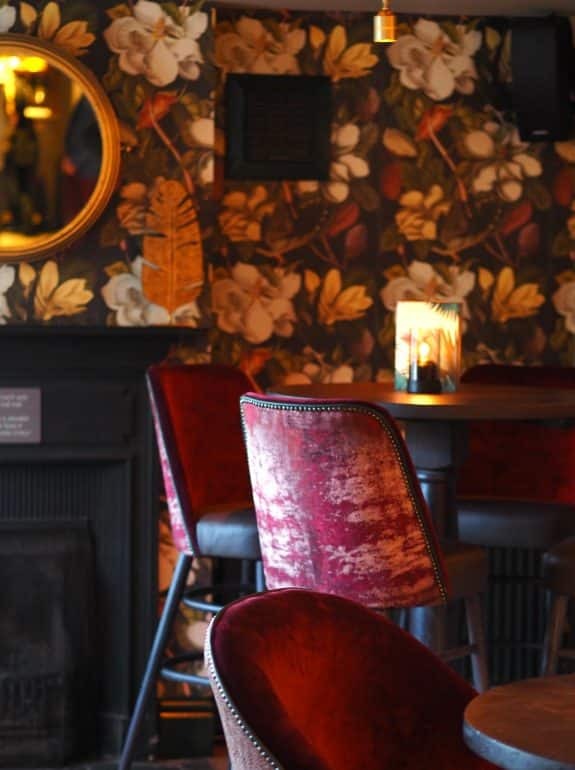 The interior is stunning and has received some significant investment. Nearby residents just got themselves one serious upgrade to their local. 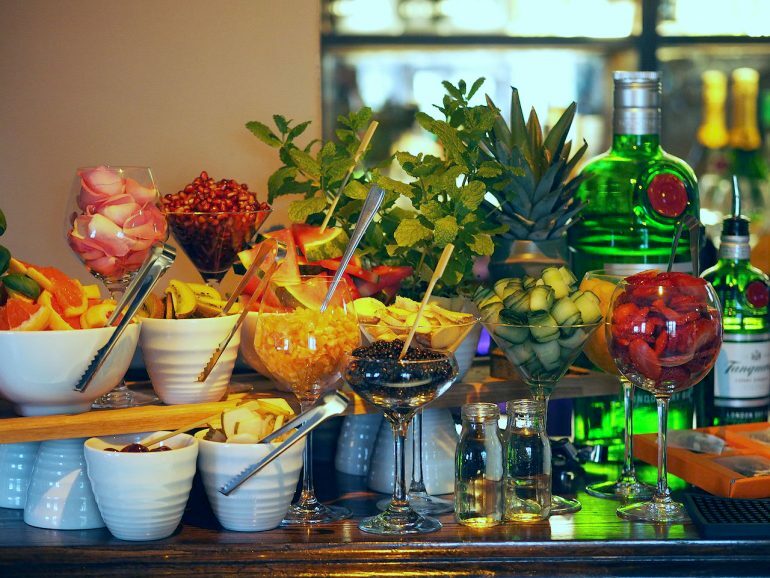 We start the evening off enjoying the beautiful self-serve gin bar with just about every topping you could hope for. I pick and mix my drink with wild abandon and go for a bizarre selection of rhubarb gin with cucumber, ginger, mint and blackberries. Move over Pimms because this strange little concoction of mine turned out to be delicious! When I review food I try not to take the piss with ordering loads of expensive drinks. But on this ocassion, The Apple Tree were ever so keen to show of their high end wines, which now come with an incredible new syringe technology, allowing them to serve said wines by the glass as well. Our waitress insisted we try the Cabernet Sauvignon which was not only her favourite but one which the pub had been serving for years, claiming to love it so much that it would never be removed from the menu. At £60 a bottle it’s one best reserved for special occasions, and in my opinion (and the table’s) this wine was delicious. 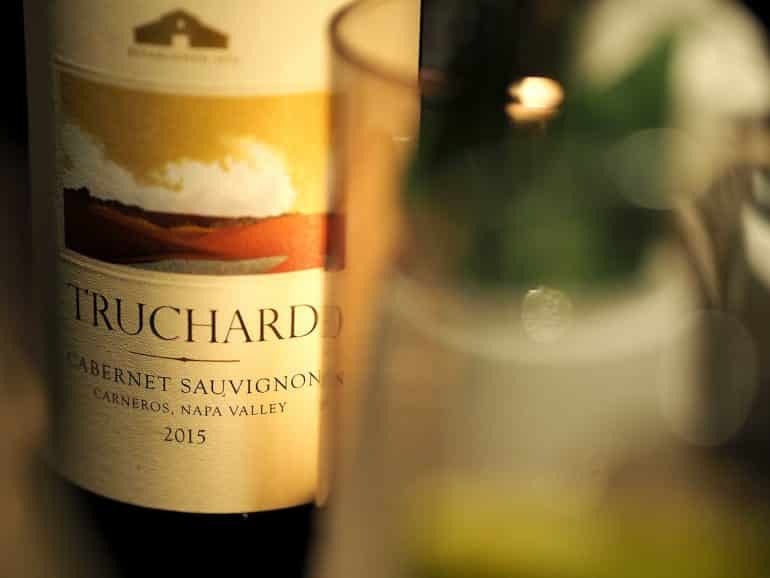 Complex, fruity and silky smooth. Just a touch of vanilla. It runs around the glass like oil. Absolutely every bit as special as it should for the price point. Starters are neatly divided on the menu into ‘Meat Free’, ‘Sea’ and ‘Land’ which I like because I usually head into a meal with an idea of how I want to kick off. It definitely helps with any indecision on what to have. 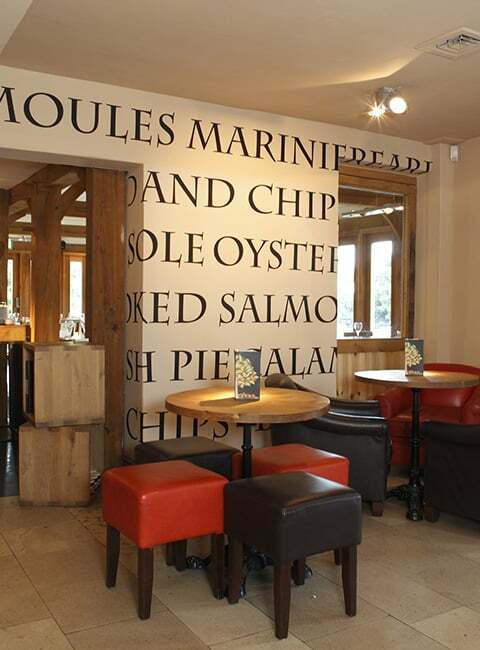 Our chosen starters ranged from £5.75 – £11.95. 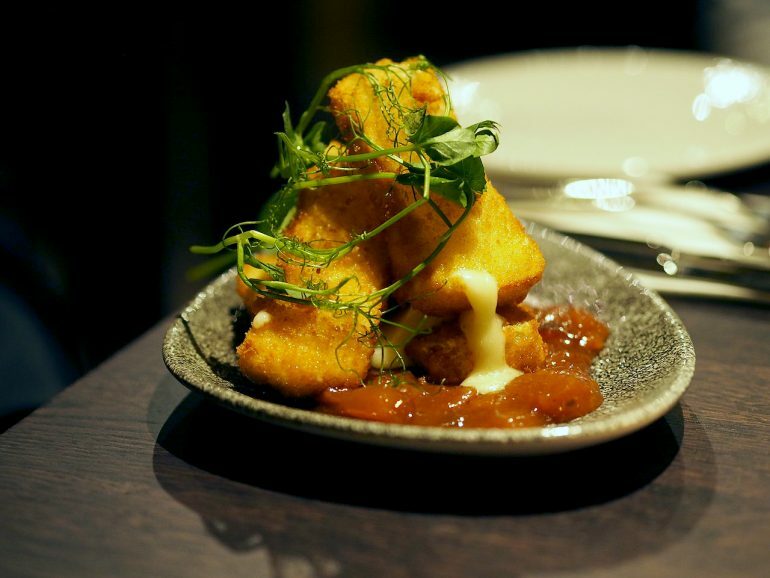 Within ‘Meat Free’ is a glorious and unapologetically large starter of panko crusted fried brie with a sloe gin chutney. Given its size I got to swoop my fork in for a taste or two. The brie is gooey and the coating is crunchy; it does everything that it should with ease. I did think the chutney was missing a level of sweetness to cut through the creaminess of the cheese however. 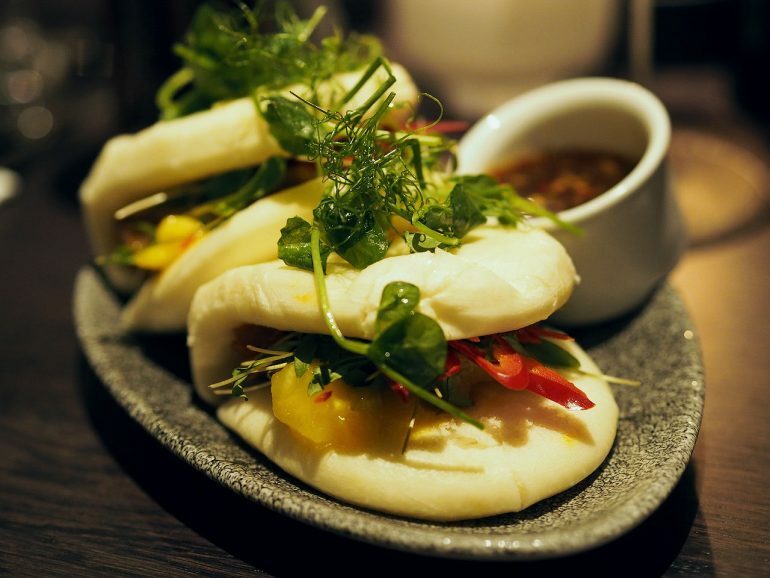 An offering from the ‘Land’ starters was pork belly bao buns with red chilli, pineapple and mango salsa. You’ll notice there’s a theme within the menu of Asian influences… alongside large portions. Again a generous starter! From the ‘Sea’ section was my starter of seared, wild Atlantic scallops with crab & lobster bon bons, pea and truffle oil veloute. This looked and tasted every bit as great as it sounded on the menu. 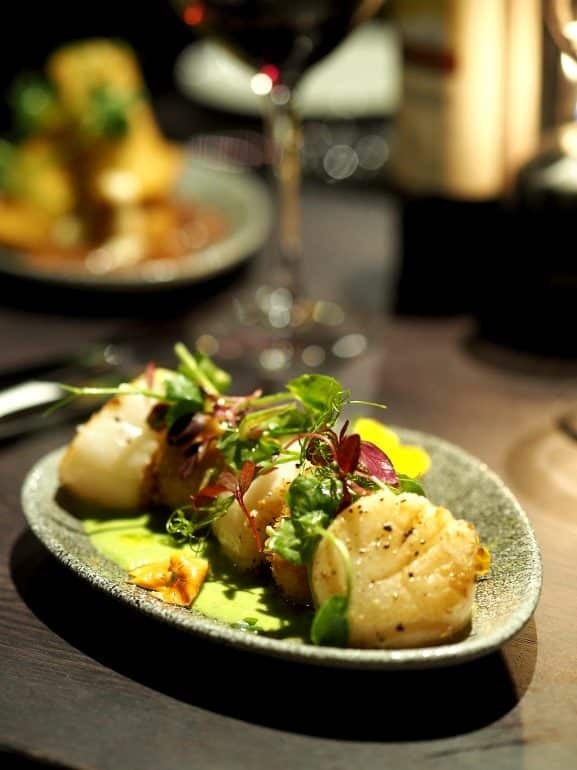 Giant and perfectly cooked scallops that wobbled as you plunged your knife into them, their simplicity contrasted by the rich and crispy bon bon that accompanied. Really delicious, my only wish was that the lovely pea puree has been a touch thicker to help cling to the seafood. 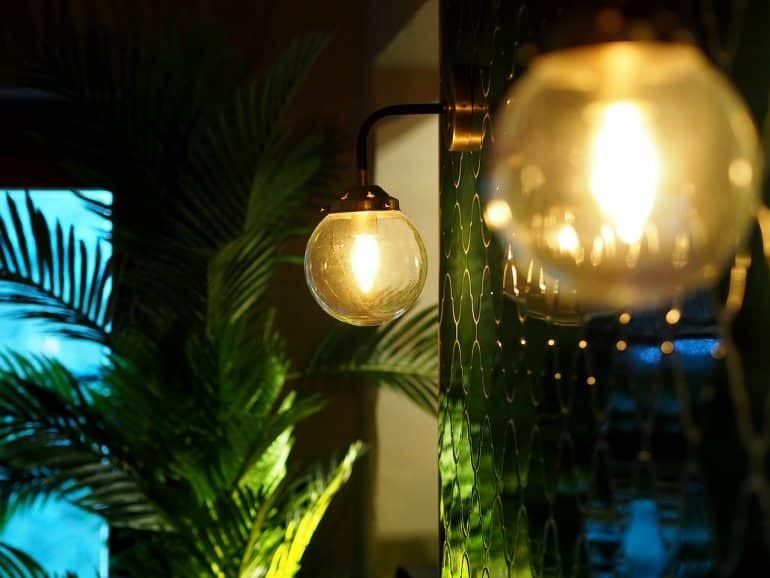 The menu is again neatly divided to assist with easy dining, this time into Healthy Mains, Rotisserie and Grill, Iconic Sharers and Comfort Food Classics. There’s a good selection without it becoming overwhelming and diluted. I was in a fish mood on this evening so my main was roasted salmon with a smoky mussel cream sauce. 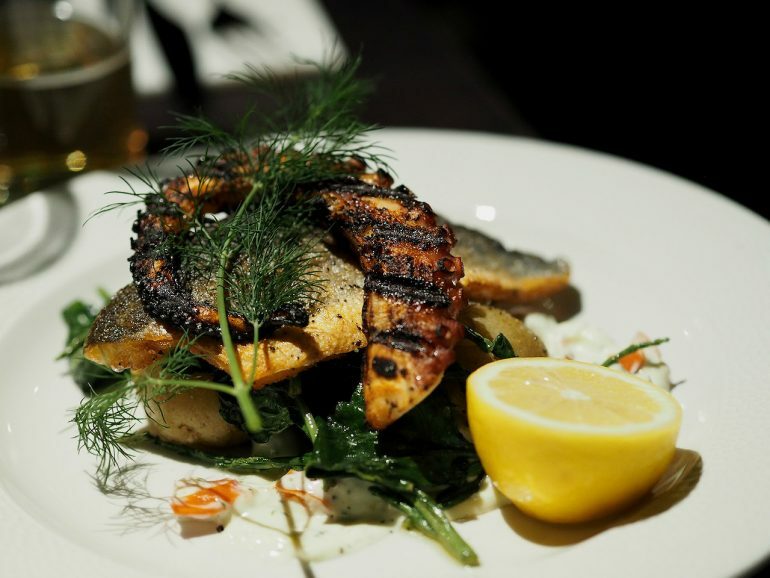 Simple and well executed; the salmon was soft and juicy with a satisfying crispy skin. 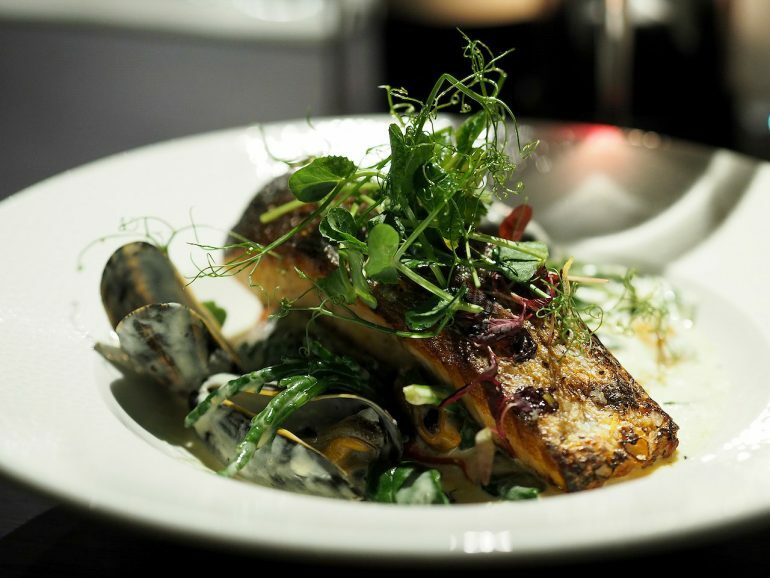 Another from the fish offering was sea bass fillet with charred octopus, baby potatoes, tomato & lemon aioli, samphire and baby spinach. 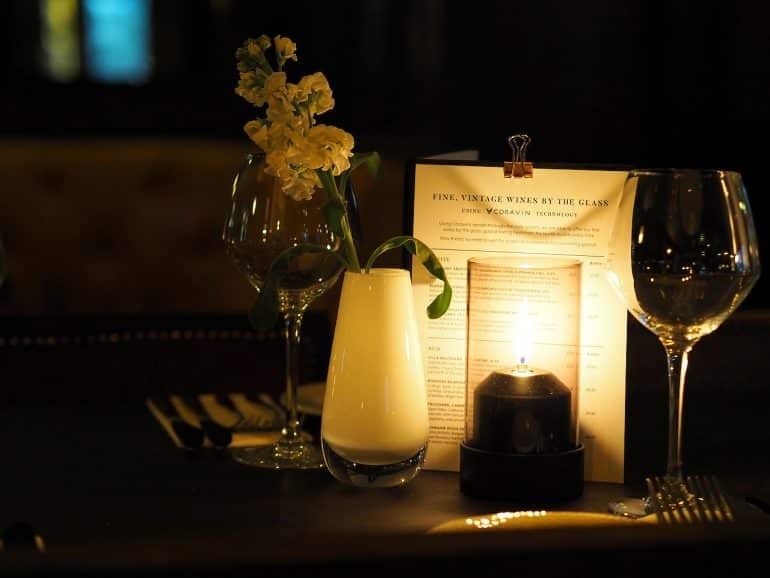 Once the weather improves these light and fragrant dishes will be wonderful to eat outside at The Apple Tree’s terrace. Classic pub dishes, that is, meat & chips came with gourmet twists. 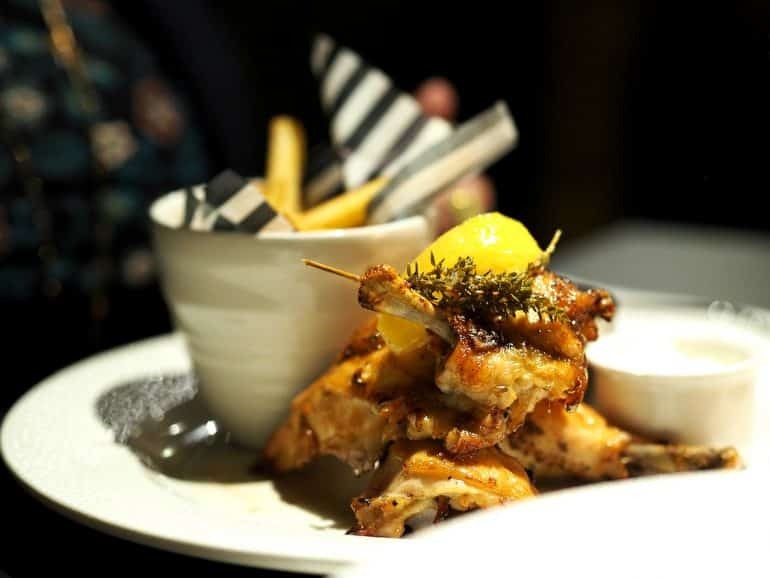 Juicy rotisserie half chicken, finished with truffle and served with skinny fries, garlic confit & preserved lemon aioli. 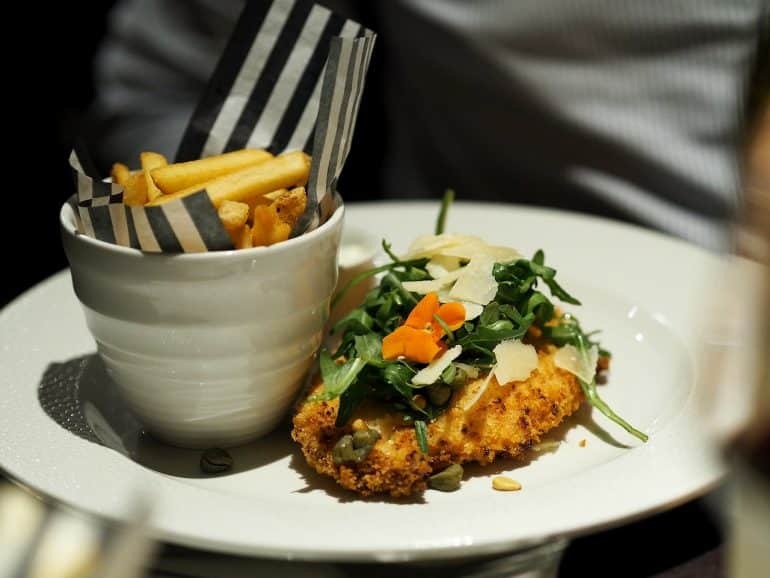 Or why not the panko crumbed (they do like a panko crumb on this menu) chicken milanese with rocket, caper, Parmigiano Reggiano & toasted pine nut salad, fries and also that lemon aioli. I clocked the dessert section before we’d ordered our starters and commented on what a great sounding menu it was. 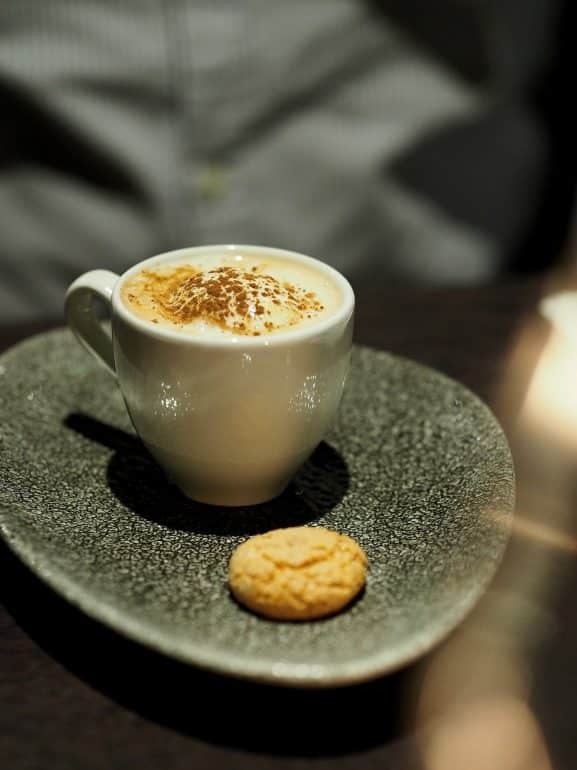 Again the menu is broken down into categories to suit your mood; in this case by temperature which I really loved because that it exactly what dictates my dessert choice at the end of a meal. 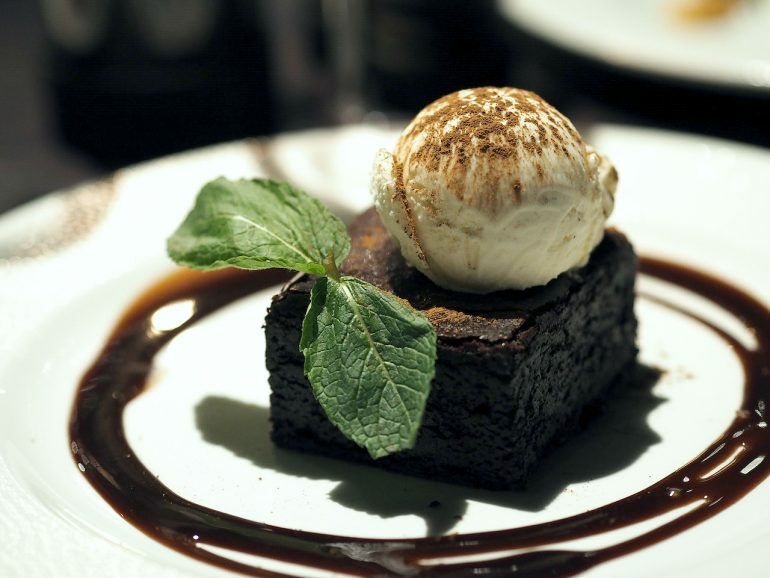 Never one for hot desserts, and with room to spare from two light fish dishes, I tackled the warm chocolate brownie, home-baked with Belgian chocolate sauce and bourbon vanilla ice cream. Much like the brie, it did everything that this simple and classic dish is meant to do. And much like any good brownie the last few rich bites felt ever so slightly challenging and utterly indulgent. 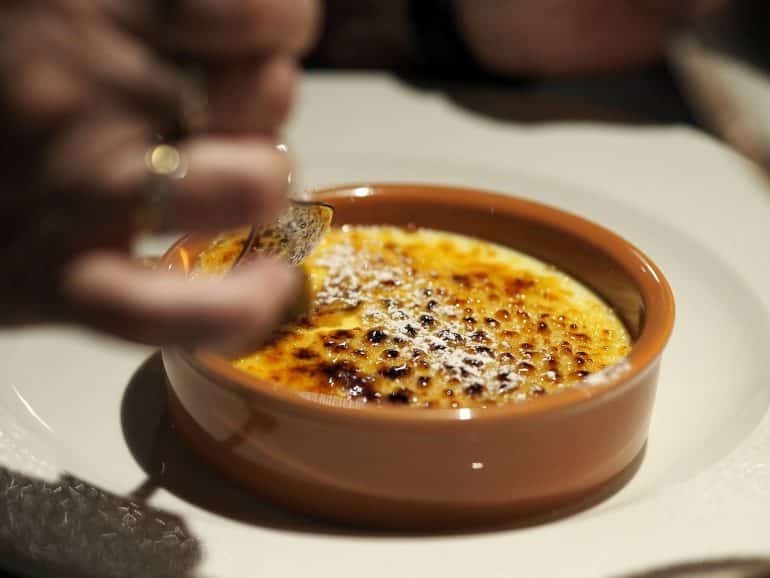 Cool and creamy creme brûlée with a sugary crust that offered a good crunch without putting up too much of a fight against the spoon. “One of the better ones I’ve ever had,” I was told. 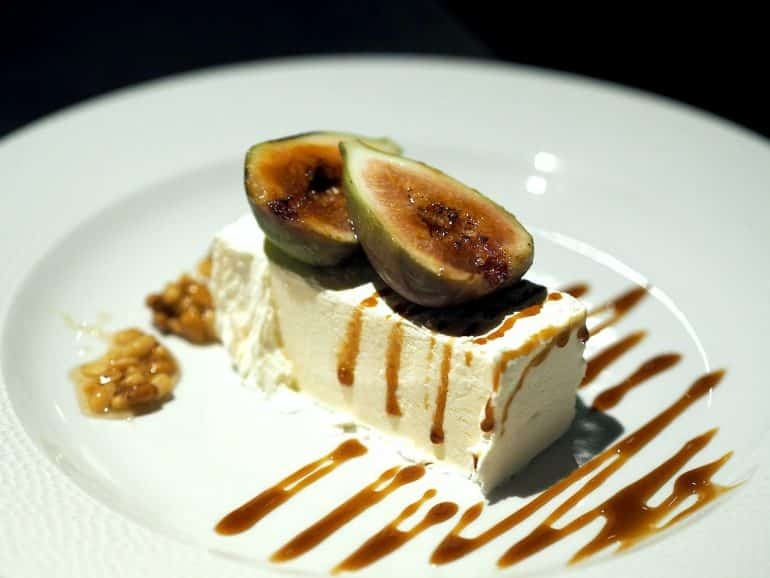 Greek yoghurt parfait with caramelised figs and pomegranate syrup. It arrived to the table a little too frozen so required a level of patience in waiting, but once thawed was a refreshing end to the meal. A final nod to the meal was a bourbon vanilla ice cream affogato. Ordered by one who is already very full. 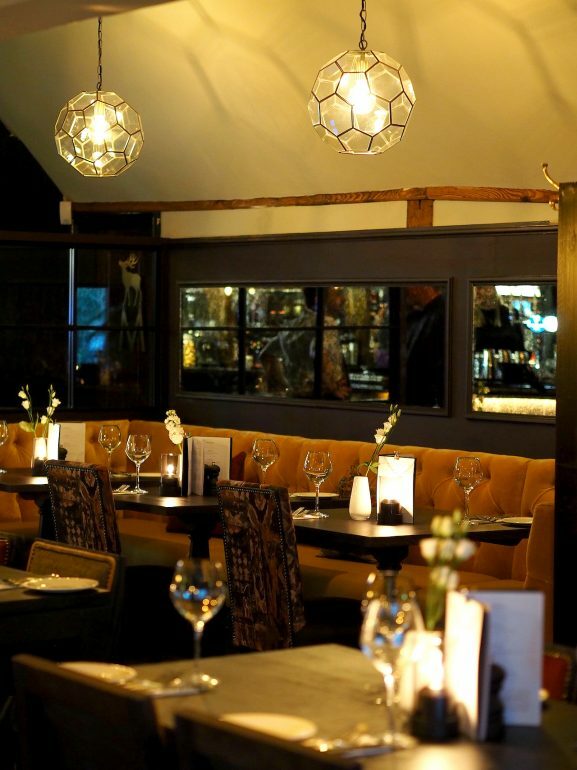 The Apple Tree is one of the biggest restaurant transformations I have seen and the staff are clearly ridiculously excited about it! Our meal was really solid and enhanced by our beautiful surroundings.